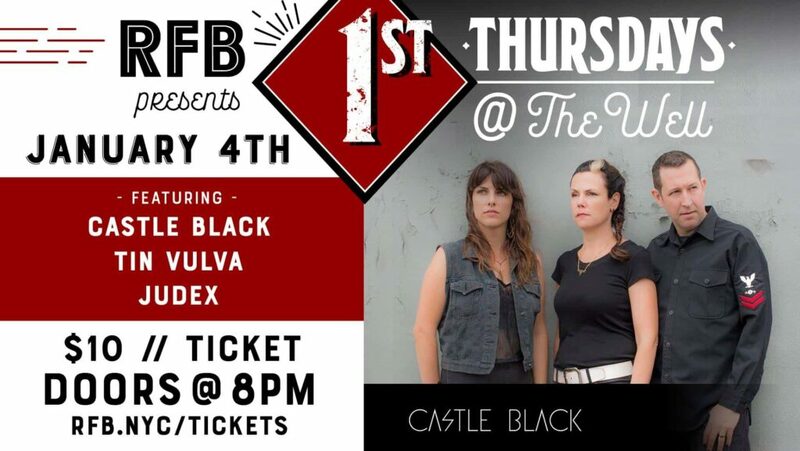 RFB’s second installment of its concert series RFB Presents: 1st Thursdays At The Well is going live on Thursday, January 4th with three great, socially-conscious bands: TinVulva, Castle Black, and The Judex. Castle Black is a trio that our Talent Director Rob Pritchard describes as “hard post-rock,” calling the music from their latest EP Trapped Under ALl You Know a “wall of moving sound.” They say their music draws from multiple genres with songs that “careen through an almost stream of consciousness depiction of life stories, social anthems, and raw emotions.” They’ve played a myriad of shows and festivals including Mondo Fest, Northside Fest, NJ. TinVulva describes their group as an “alternative punk-inspired band with riot gurrrl soul and rhythmic grunge undertones” with a history of supporting a wide range of causes with their music. These four misfits represent a diverse group of identities coming together to make awesome sounds that get you on the floor and are nothing like you’ve heard in the mainstream. Tickets are available online (with no fee!) and at the door for the first RFB Presents: 1st Thursdays at The Well in 2018. The bands hit the stage on Thursday, January 4 – doors open at 8pm at The Well, 272 Meserole St. in Bushwick, BK.